FRANK: In the winter of 1993, after we had been baking for six months, we added about six new varieties of bread to our repertoire. 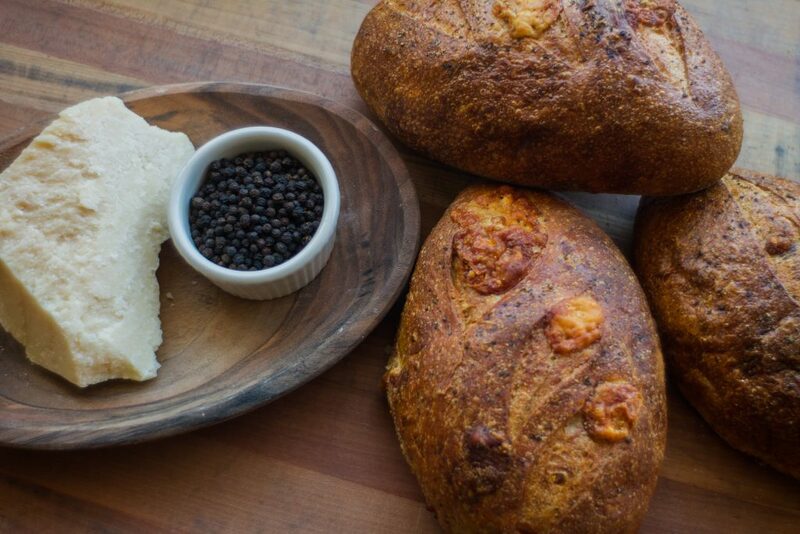 Our partner Ari suggested that we make bread with the combination of Parmigiano- Reggiano cheese and Tellicherry black pepper. Zingerman’s Delicatessen was a great source for both of these ingredients. We purchase 80-pound wheels of this king of cheeses and split and trim them each week to make what is still one of our most popular specialty breads. During our busiest days in December, we’ll bake more than 300 of these loaves daily for several consecutive days, which means that we use more than one wheel of cheese each day. Because of the generous amount of cheese in each loaf, these are very delicate to shuffle in the oven with a large peel. Occasionally while unloading we’ll “stab” a loaf and it will be unsellable. While this is unfortunate, the loaf doesn’t go to waste. It gets placed on the rack next to the oven, where we keep our baking tools, and is usually there for no more than an hour. I should film our staff walking past this damaged loaf, looking at it, and then grabbing a chunk of warm and delicious savory goodness. I personally go for the melted chunks of cheese that make their way to the surface of the loaf. Place the water in a large mixing bowl. Tear the levain into small pieces and add to the water. Add the whole wheat flour and half of the all-purpose flour. Stir with a wooden spoon to combine and break up the levain. Add the remaining all-purpose flour and the salt. Mix until the dough is rough and shaggy. Turn the dough out onto a clean, unfloured work surface, scraping any bits of flour or dough out of the bowl. Knead the dough for 6 minutes to develop the gluten. Be sure to stretch and fold the dough over and over again, so that gluten strength is developed. Spread out the dough and gently form it into a rectangle. Sprinkle the cheese and pepper onto the rectangle. Carefully gather up the edges of the dough, keeping the cheese and pepper inside. Knead for another 3 to 4 minutes, or until the cheese and pepper are both uniformly distributed in the dough. Place the dough in a lightly oiled container and cover with plastic. Ferment for 3 hours. The dough will grow in volume by about 50 percent. Uncover and place the dough on a lightly floured work surface. Divide into two equal portions, and pre-shape each piece into a ball. Allow to rest for 30 minutes, covered with plastic. Uncover and reshape each piece again into a round. Place the rounded loaves on a cornmeal-covered surface with the seam side down. Cover with plastic. Allow the shaped rounds to proof for 3 to 3½ hours. Use the touch test to see if the dough is ready for the oven. Preheat the oven with a baking stone and cast iron skillet (for creating steam) to 450°F [230°C] for 45 minutes before baking. Uncover the rounds and brush the top of each with water. Sprinkle some coarsely ground black pepper on top. Place the rounds side by side onto a lightly floured peel. With a razor blade or sharp knife, make a single diagonal slice on the top of each round loaf. Slide the loaves onto the baking stone and add steam to the oven by adding several ice cubes into the cast iron skillet. Carefully place a stainless steel bowl or aluminum pan over the loaves, making certain that the edge of the bowl extends over the edge of the baking stone, allowing it to capture and contain the steam produced by the ice cubes evaporating. Close the oven door. Keep covered for about 8 minutes, uncover, and bake the loaves for an additional 22 to 28 minutes, or until they are nicely browned and sound hollow when tapped on the bottom. Remove the loaves from the oven and cool on a wire rack. Cool completely before slicing.